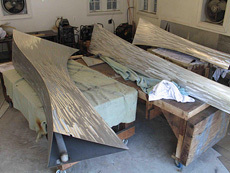 This sculpture was commissioned as the result of a National Competition. 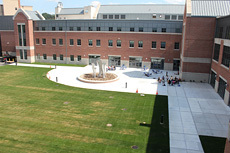 Rubenstein Studios has recently completed a major installation at the University of Connecticut Waterbury campus. 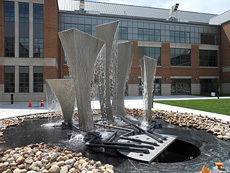 This beautiful and recently rebuilt campus wraps around a common space, which is now graced with “Synergy,” a stainless steel water sculpture. 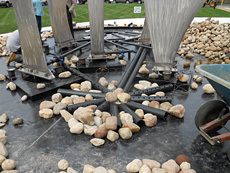 Standing at 12’ at its highest point, these five elements rise out of a bed of river stones in a 30’ diameter pool deck. The sculpture has quickly become a gem for the city, with students and visitors visiting the site both during the day and evening, particularly when the light illuminates the site. 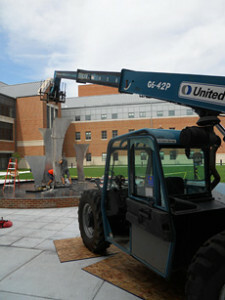 Rubenstein installed this sculpture during the summer of 2010, just in time for the academic year. 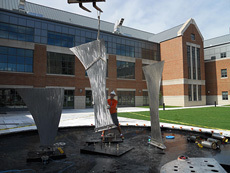 Using a forklift, each element was carefully placed on its respective bolts, and then plumbing was installed, connecting each sculpture to a pump in the reservoir. 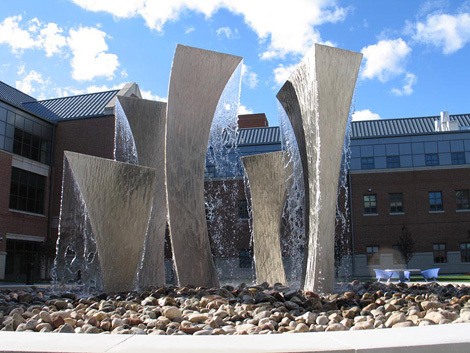 Rubenstein designed the water for this sculpture to be flowing on and off during the day, creating a constantly changing environment. 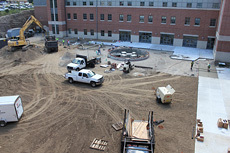 A dedication is planned for the spring of 2011.